Kohlrabi. Just the name sounds funny, and it looks even funnier. I have to admit, I still haven’t exactly figured out a recipe that really features kohlrabi. It’s kind of like a dense bulb of leafless cabbage. It can be purple, green, or white, and has yet to truly capture my excitement in the kitchen. Why then do I post recipes for it? Because it grows SO stinking great in the Pacific Northwest! 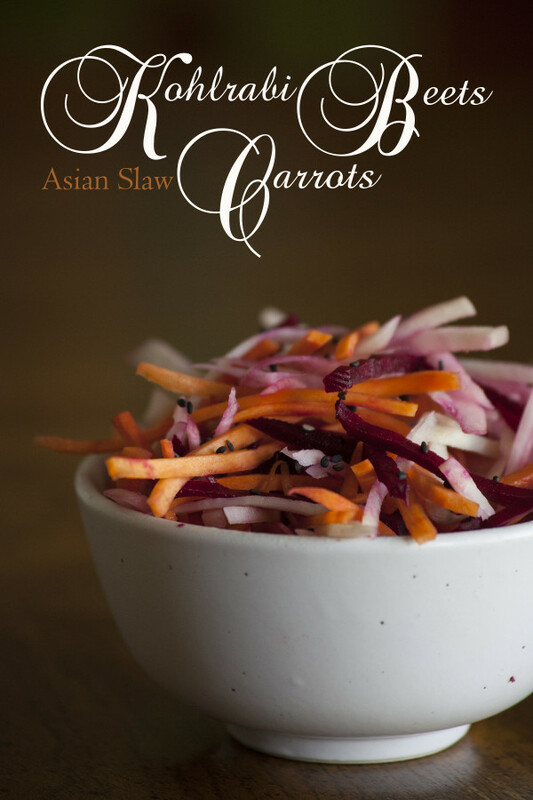 This simple Asian Slaw is a great way to use some of the colder weather vegetables we can currently grow (or get in a CSA box). 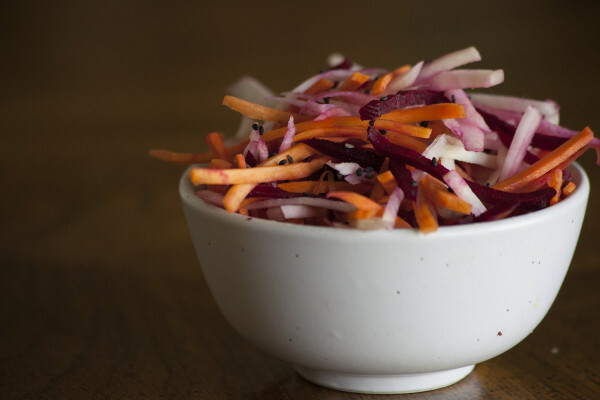 The lovely colors feel perfect for fall, and the unique umami and tangy tastes make this salad great for pairing with hoisin wings or kalbi beef. I do have one more kohlrabi left from our CSA. This one is almost as big as my head! I’m thinking of making my friend Elise’s kohlrabi ham bake. Do you have a food that intrigues you but you haven’t quite found a favorite way to eat it? Tell me I’m not the only one! Approximate cost/serving: When in season, these vegetables are ridiculously cheap. The whole recipe cost me less than $1 so we’ll say just 25 cents a serving. Vegetarian/Gluten Free: This is vegetarian, vegan, and gluten free with no changes needed.